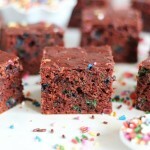 Red velvet protein bars packed with birthday cake sprinkles for a funfetti effect! 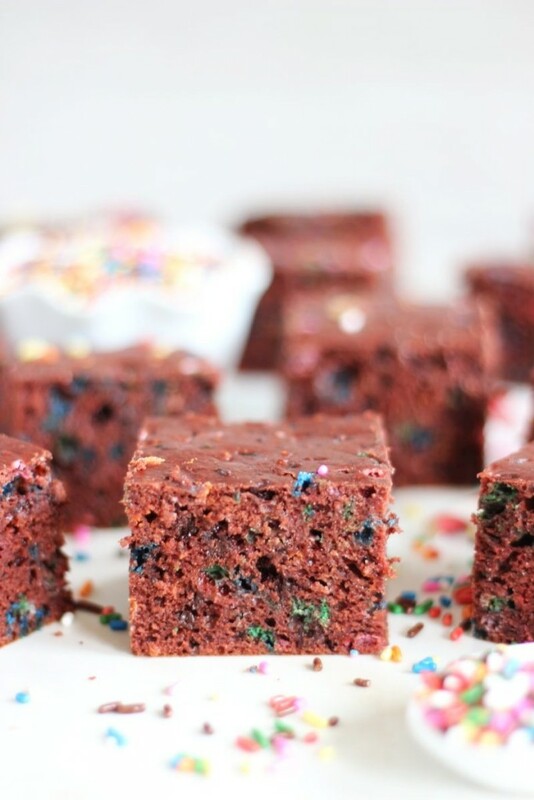 They’re high in protein and deliciously decadent with milk chocolate and cream cheese flavors! How about something healthy to mix things up? I have a lot of protein bar recipes coming up. I’m on a healthy baking kick. 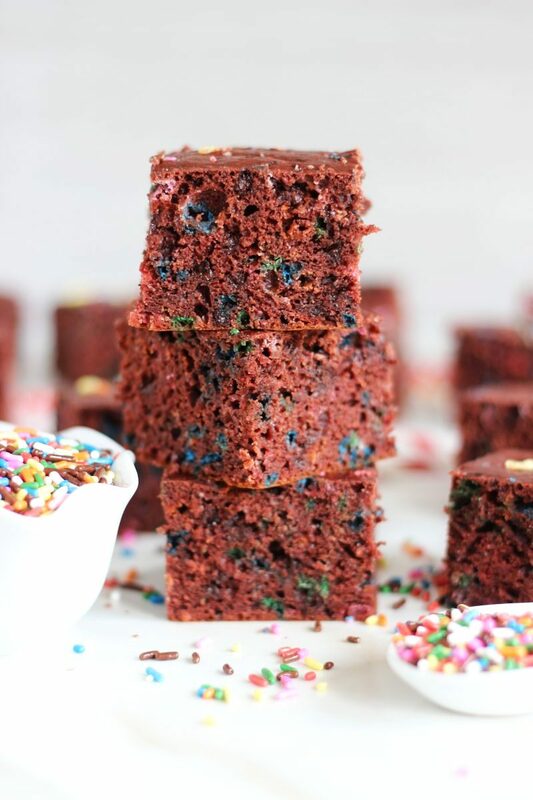 I really love ALL baking, and because I eat nutritiously the majority of the time, like a solid 90% of the time, I was really into healthy baking for several years, shortly before I started this blog. 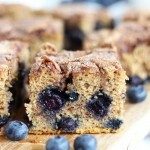 I would substitute everything in baked goods – applesauce for oil, or Greek yogurt, egg whites instead of whole eggs for extra protein, whole wheat or oat flour for all-purpose, add in protein powder, things like that. And I’d reduce the sugar content. Much of the time, you just don’t even notice. I love to bake either way, healthy or decadent, and I want to get back to incorporating more healthy and wholesome baked goods. With these bars, I won’t have to ration myself from over-indulging. I can consume them plentifully, and guilt-free. 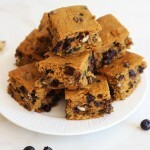 These are made with oat flour, definitely my favorite ‘healthy’ flour. 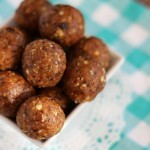 It’s very mild in flavor so it doesn’t interfere with other flavors, and like oatmeal, it’s filling and full of fiber. With chocolate protein powder for added protein, cocoa for antioxidants (and chocolate flavor, obviously), and cottage cheese for MORE protein, moisture, and cream cheese/cheesecake flavor. Made with egg whites only for still more protein. 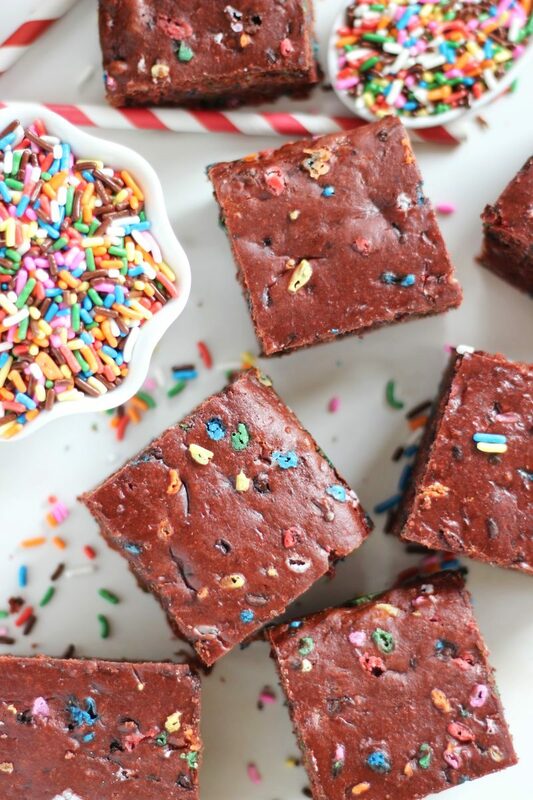 Sprinkles and a few mini chocolate chips round out these bars with flavor and a bit of indulgence. Still, it’s tough to make a baked good healthier than these. 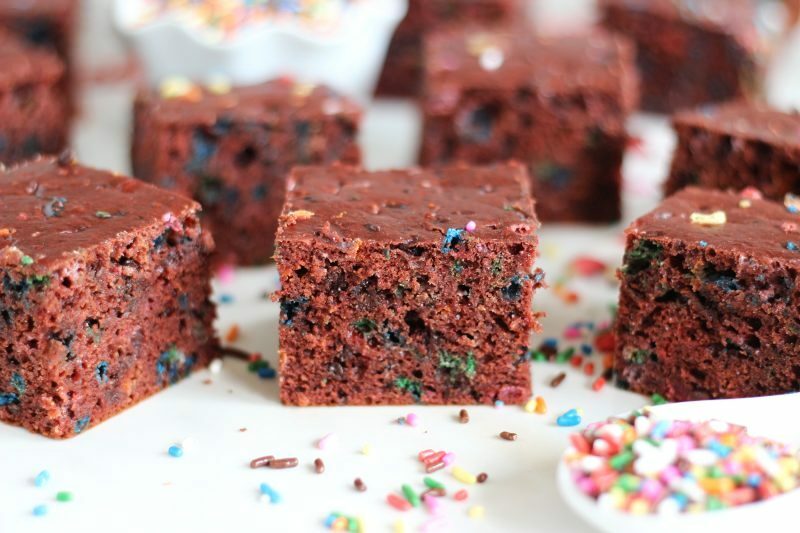 If you really want to keep these bars ultra-clean, you can skip the sprinkles and chocolate chips. But a little bit of never hurt anyone! My favorite brand of protein powder (trust me, I’ve tried them all), Trutein, makes a Red Velvet Cake flavor, but you don’t need to have that specifically to make these bars ‘red velvet’. Any chocolate, preferably milk chocolate, protein powder will give you the light cocoa flavor you want for these bars, and the cottage cheese provides the ‘cheesecake’ element. 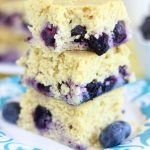 They seriously don’t sacrifice taste for nutrition, and they make for a great snack to take on-the-go or for a quick breakfast. 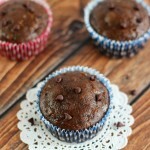 One of my favorite healthy baking recipes to date! 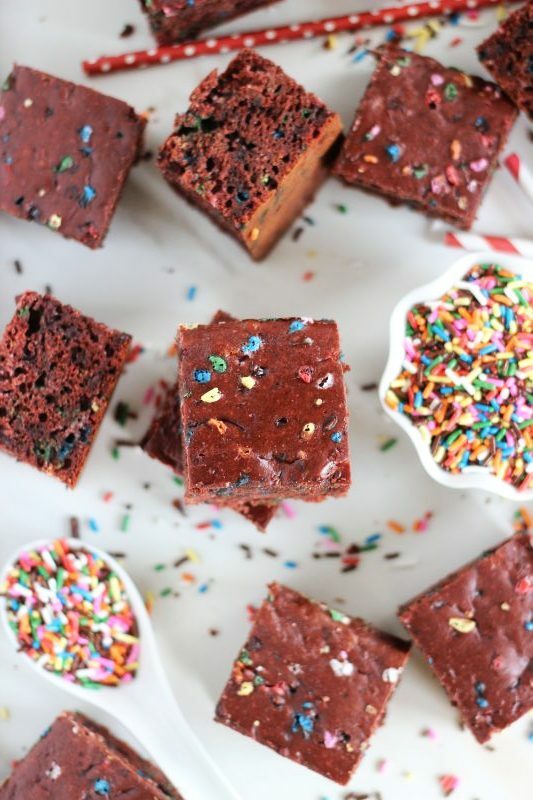 Red velvet protein bars with a bunch of birthday cake sprinkles for a funfetti effect! In a large bowl, whisk together oat flour, chocolate protein powder, sugar, baking soda, and cocoa powder. In another large bowl, whisk together cottage cheese, egg whites, almond milk, and red food color (if desired). 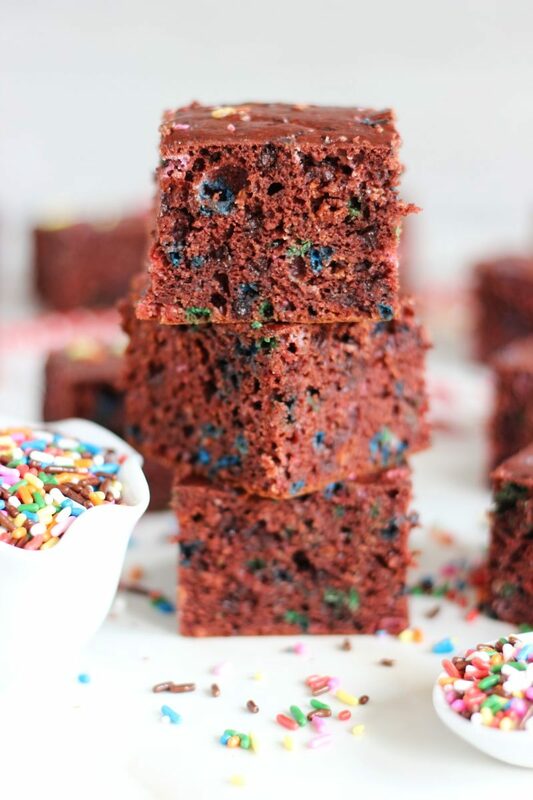 Fold in the sprinkles and chocolate chips. These freeze well, so you can keep the freezer stocked for emergency snacks. Made these last night and they are AWESOME!! 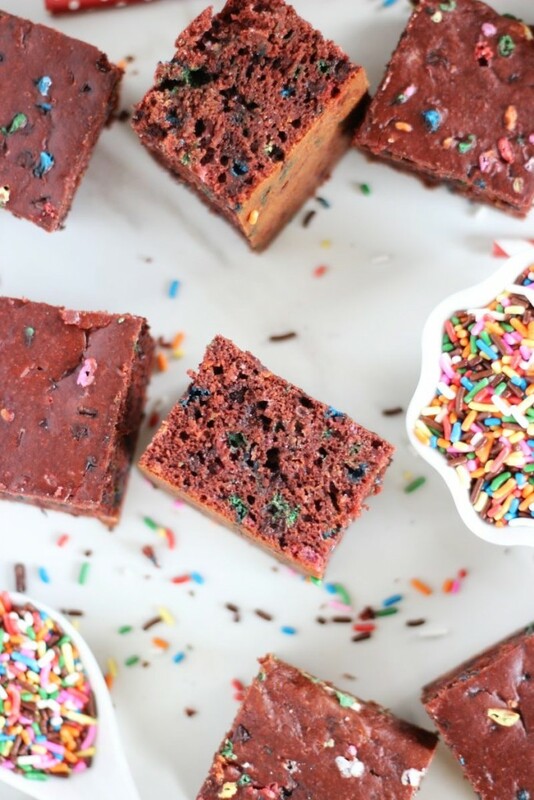 They are waaaaaay better than any protein bar you could buy at the store; and actually taste like cake. As a picky eater with a massive sweet tooth, who really does want to eat healthy, thank you, thank you, thank you! The only problem I did have was getting the middle to set. I had to put it back in the oven and it was still a little mushy. Which was ok with me, because I do love batter, but hopefully I’ll figure it out next batch, because I definitely plan to make these again as soon as they first batch is gone.